Brother CE7070PRW is a good beginners sewing machine, but there are similarly priced, better alternatives available from Bother itself. Brother Project Runway CE7070PRW is a computerized sewing machine. It is one of the popular models in the ‘Project Runway’ series of sewing machines from Brother. The versatility and customization features on this sewing machine is perfect for beginners. It comes with 25 years limited warranty. 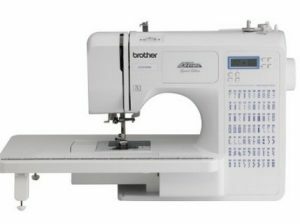 Brother CE7070PRW has 70 built-in stitches (includes decorative and quilting stitches) and 7 automatic one-step buttonholes. Top drop-in bobbin system makes bobbin replacement easy. The extra wide table is a great addition. It lets you work on larger projects without any trouble. You can select the switches using the push buttons and view it on the LCD display. LED work light illuminates the work space quite well. One thing I really liked about this sewing machine is that it comes with quite a lot of accessories ranging from zigzag foot to extra wide table. The auto-needle threader saves the pain of threading. The needleplate marking on Brother CE7070PRW lets you sew in straight line. You can keep the needle at perfect distance by following the needleplate markings. User manual comes in two languages English and Spanish. The user manual has quite a lot of detailed information. It explains all the functions, how to thread, wind the bobbin etc. This sewing machine is extremely light, so it won’t be an issue if you want to take it to your sewing class. You can easily lift it with your left hand (If you are right handed, you know what I mean,right?). Stitches come out nice and perfect. Stitch quality is consistent over multiple layers of fabrics. This sewing machine is quiet too. The top drop-in bobbin with clear cover lets you keep an eye on the thread supply. There is a thread cutter as well. There is a button for reverse stitching. You can easily adjust the stitch width and length using the buttons next to the LCD screen. There has never been an issue with jams or tension. It is a high quality, little machine. One thing I would have really liked to have is a needle position and speed control feature, which Brother CS6000i (Similarly priced machine) has. Also there is no hard cover included. Overall, Brother CE7070PRW is a fantastic sewing machine for beginners. Most people are confused whether they want to buy Brother CE7070PRW or Brother CS6000i. Both are similarly priced and highly rated. But I would prefer CS6000i over this one because, CS6000i has all the features that this sewing machine doesn’t have (may be 10 less built-in stitches, but I will take that for the extra features CS6000i has). Moreover, it has more metal parts than CE7070PRW.